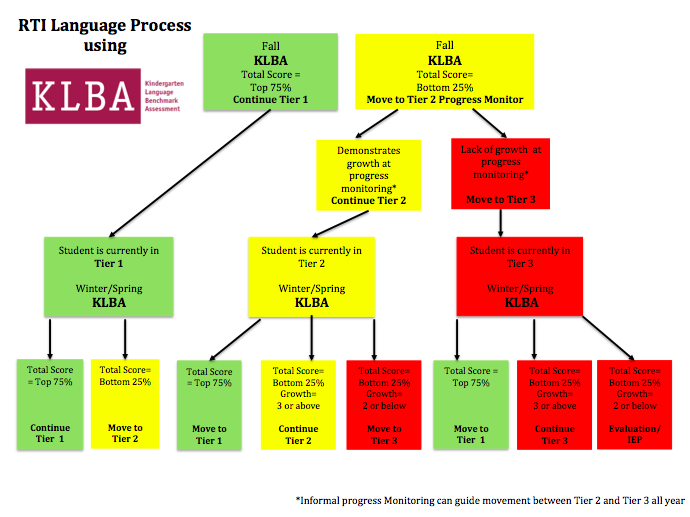 The Kindergarten Language Benchmark Assessment (KLBA) is the perfect tool to guide a Response to Intervention (RTI) process for language in kindergarten. The KLBA can be administered in 3-4 minutes by any trained school personnel. Using the data, schools can create local norms in order to tier instruction. Tier 1: All students, including those with IEPs, are tested at the beginning of the year using the KLBA. The speech language pathologist provides in-class modeling and support for language techniques. Tier 2: Students who fall into the bottom 25% of the class receive extra language support in small groups, regardless of their primary language. These students are progress monitored bi-weekly to ensure that they are progressing with their language skills. Students who make progress continue in Tier 2 support. Those who do not make progress may require more intensive support. We recommend using the direct instruction program Language for Learning, available from McGraw Hill. This program can be administered by a teacher or classroom assistant. We have also used this program successfully with an entire classroom of English Language Learner (ELL) students. Tier 3: Students who are not making adequate growth at Tier 2 receive Tier 3 services. Tier 3 services are provided in smaller groups by the speech language pathologist. These services are similar to traditional speech language therapy. Students are re-assessed with the KLBA in the winter and spring. Students who move into the average range can be discontinued from Tier 2 or 3 services using this data. Students who continue to fall in the bottom 25% and are making adequate progress will continue at their current Tier of instruction (e.g. continue in Tier 2). Students who fall in the bottom 25% and are not making adequate progress will move to a more intensive Tier (e.g. move from Tier 2 to Tier 3).